Welcome to Kindergarten at P.S. 212Q! Friday, April 19th to Friday, April 26th, 2019. School will reopen on Monday, April 29, 2019. Please come to see Kindergarten perform. Phonics: Students will be continuing to practice sight words, sound out and tap out CVC words. They will also be learning digraphs (sh, ch, th, wh) and blends to help them read higher levels. Math: We are learning to name 2 Dimensional & 3 Dimensional shapes and their attributes. Readers tackle more challenging books by recognizing a pattern, figuring out the changing words in the pattern, and using the super powers. Students will learn how to write stories that are easy for a reader to read and understand. They will be using their sight words and their abilities to sound out new words in order for the reader to read the story easily. Phonics: Students will be continuing to practice sight words, sound out and tap out CVC words. They will also be learning digraphs (sh, ch, th, wh) to help them read higher levels. Math: We are learning to represent, count, and write 20 and beyond. We count objects to 100 by 1's, and 10's. Monday to Friday, February 18 - 22, 2019 for Mid-Winter Recess. ​ beginning, middle, and ending sound. more, and recording the number words. Reading: Readers read use "Super Powers" to read. Readers read with print strategies and sight word power. ​ pattern sentences to describe different things. Phonics: Continue to practice letters, letters sounds, and sight words being taught. We are beginning to write simple sentences using the sight words. Have a safe vacation and best wishes for the New Year! starting from Monday, December 21, 2018 to Tuesday, January 1, 2019. School will reopen on Wednesday, January 2, 2019. Reading: Recognizing the sight words and reading behaviors . Writing: We are writing like a scientist. We look at things closely to look for details. We can draw the picture and label the parts. will be on November 15, 2018. The report card will be sent home on Wednesday, November 14, 2018. Please sign and send it back to your child's teacher. Keep the bench for November at home for your reference. Please sign and return the Just Right Reading Level Progress paper back to your child's teacher. is on Wednesday, November 14, 2018, from 8:30 to 10:00 am. Phonics: Review uppercase and lowercase letter names and sounds. Math: Number recognition and writing number 6-9 and different ways to make a number. Reading: Read and retell emergent story books. Writing: Writers can write longer stories by adding details and write more sounds when labeling a picture. Writers label the pictures and attempt to write a sentence. Brighter Bites is coming to our school. Their mission is to create a healthy community by learning about fresh fruits and vegetables. Don't forget to submit your application to take home a bag of fresh produce. This program will run 8 weeks in the Fall and 8 weeks in the Spring. Halloween parade will be on October 31. Please come and see our children walking around the school block. Math: Number recognition, writing, and comparing numbers 0-5. Writing: Able to generate a topic about somethings that they know a lot about. Able to generate a story from their own life. Open school night was a great success. We were able to meet with many new families in our school community. We look forward to a year full of learning and wonderful experiences. Thank you! * Thank you for sending in your child's school supplies in a timely manner. If you have not done so, please send them in as soon as possible. * September and October will be spent learning the letter names and letter sounds. We will also be learning sight words which will be in your child's flipbook. 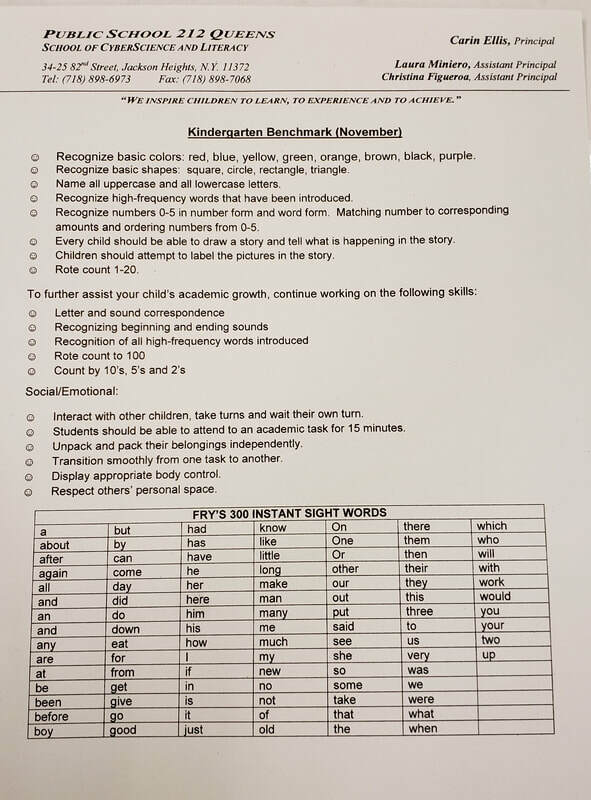 Please review letters and letter sounds with your child every night. * We will begin formal reading assessment at the end of September. *Children should be wearing sneakers on Physical Education day.